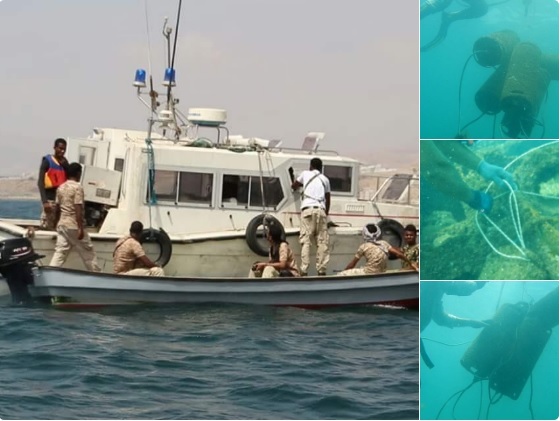 Hadrami Elite Forces-Anti-Terrorism Unit and the Coast Guard deployed a team of divers and mine experts to remove a sunken ship near the shores of Mukalla Hadramout after some local divers reported that there were mines and explosives at the bottom of the ship which were planted by elements of Al-Qaeda during their control of the city of Mukalla. The specialized team dismantled the explosives which were estimated to weight more than (half a ton) and were taken away from the seaport and beaches of the city to the depths of the sea because they contained heavy explosive materials that's dangerous if placed on mainland. Captain of the specialized mines and explosives team Colonel Abu Saleh Al-Yafai, said that these discs contained huge quantity of explosive material where, God forbid, it were to explode the damage would reach far to the houses overlooking the main road of the city of Mukalla. It's very important to point out that the amount of explosives and bomb-making material that has been collected and disassembled in Mukalla since liberating it from Al-Qaeda in April of this year to this date is estimated to total 1,800 tons of mines and explosives, and work is still underway to get rid of the remaining quantities. We would like to offer our sincere thanks to those fearless divers the patriot sons of al-Mukalla and who if it wasn't for their bravery in reporting what they saw, none of this would have been achieved. We would also like to call on all citizens and especially fishermen to follow the example of those patriot divers and report anything suspicious.